And welcome aboard Sir or Madam! Back in Aden, Charles had been mulling over a problem in his spare moments… He didn’t really have all that much practice building ships, much less ships that had to support rather a lot of people – and he didn’t want them to find out that he’d forgotten something important when they were a thousand light years from the nearest liveable planet! Hey, wait! Why COULDN’T he build a mobile manse? Sure, setting up a remote link to it’s demesne was a silly waste of geomantic power – but if you did it right… you could take the demesne along! Brigadoon Manses are simple domed structures located at the center of similarly domed disks of countryside a mile across – a little more than five hundred acres of idyllic landscaping, including a tiny forest, numerous small (and often vertical) farms and orchards, trickling streams and ponds, parks and playgrounds, flower gardens, and winding paths, tunnels, ravines, and bridges – all artfully arranged to seem considerably larger then the area really is. The area inside enjoys long, beautiful, days with just enough weather to keep it interesting and to water everything optimally. Thanks to various manse enhancements, a Brigadoon can support a population of several thousand without recourse to further magic. From the outside they act a lot like freeholds; they’re pocket realms with limited access that look like something that fits into the local landscape. What makes them more unusual is that they’re mobile; the influence of the Manse allows those inside it to move the entire area in engulfs – manse, demesne, and all – at FTL speeds. For those who want to get on and off, Charles has included a few Aquila-Class Military “shuttlecraft” with Helmstones and underground berths scattered around the edges – just in case. Brigadoon-Class Starcruiser: Rank-5 Adenic Manse. Creation Points: 10 (Rank) +5 (No useful Hearthstone) +9 (Boosting Artifacts) +1 (Maintenance 1; A Brigadoon is partially dependent on it’s own aesthetics – and so requires occasional trimming of trees, rearrangements of flowerbeds, and similar small tweaks to remain functioning) = 25. Exotic Aspect/Aden (1): Aden-aspected manses favor Magical Conveniences, Integrated Artifacts, Thaumaturgic Enhancements, Wyld Revocation, and Life-Sustaining functions. Zone of Influence (3): At rank five the powers of a Brigadoon Manse cover a half-mile radius – enough for a modest settlement, especially given the use of underground areas. Life-Sustaining (2*): The people within a Brigadoon do not age noticeably, are highly resistant to disease and poisons, and recover from injuries with incredible speed. Indestructible (5): With it’s essence-patterns and flows knotted back upon themselves in perfect loops, a Brigadoon is indestructible – vulnerable only to internal geomantic sabotage. That’s a most difficult task, since it’s maintenance services will tend to undo such damage faster than it can be inflicted. Since this extends throughout the Zone of Influence, it also means that the outer “hull” (the dome and slab of stone it’s built on) are similarly indestructible. That suffices against most minor hazards. Sympathetic Loom (Artifact ***): This device mirrors the actual Loom of Fate – but does not provide any ability to actually manipulate fate or make corrections. It DOES allow it’s users to examine the current state of the true Loom, to see if problems are developing, and to run basic simulations on near-future (up to one week per level of the manse it’s mounted in) plans to see if a proposed course of action is likely to be a total disaster. Sadly, this – as usual – will yield inaccurate results if high-powered essence users other than the operators will be intervening and cannot indicate problems that lie outside it’s time-window. Ansible (Artifact **): This bulky console sometimes takes several minutes of fiddling with to make a connection, but lets you call and talk to anyone else equipped with similar artifact. Observation Dome (Artifact **): This artifact is, in fact, the inside of the large dome over the manse and the various control consoles. It lets those within the manse clearly see, and target thaumaturgy on, things outside the manse without letting those outside see in. It can be adjusted to show infrared or ultraviolet, panoramic views, and to magnify by up to 50x, like a good pair of binoculars. Orrery of Antikythera (Artifact **): This artifact is a computational and display aid for Sidereal Astrology. Once set up in a manse it provides a bonus on Sidereal Astrology checks equal to the (Manse Rating +1) for any Sidereal working with it. 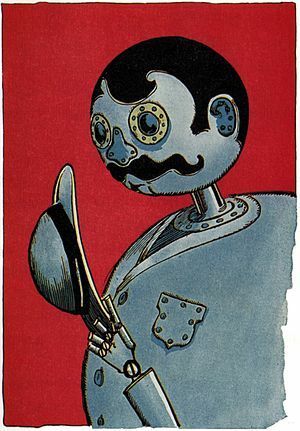 Tik-Tok the Clockwork Autopilot (Artifact *): Tik-Tok is roughly equivalent to a Folding Servant, but can only operate within the Brigadoon Manse and it’s Zone of Influence, has no offensive capabilities, is better at Occult, Interstellar Navigation, and so on than Crafts, and has an internal library of thaumaturgic effects to run the Brigadoon with and do its maintenance rather than recipes. Tik-Tok isn’t actually very GOOD at piloting or running the place – its skills are limited compared to a real experts – but it can handle things in a pinch, or if the crew is incapacitated or some such. Advanced Magical Conveniences x2 (1* +1*): A Brigadoon Manse provides modern water and sanitation services, power and lighting, an earth-gravity environment, internal computer services and communications, comfortable (and mostly subsurface) housing, swarms of “unseen servants” (these handle keeping things nice and clean, doing the maintenance, maintaining the landscaping, doing the farmwork and harvesting, and otherwise taking care of the place), fertility control (keeps the population – both human and animal – under control and prevents pests from becoming established), magical fertilizers and irrigation for the plants, greatly accelerated plant growth and yields, and subtle illusions that help the place seem far larger (and far more private), throughout it’s zone of influence. Comfort Zone x2 (2): The environment within the Zone of Influence is always livable – with long beautiful days, obliging weather, fresh, clean, breezes, comfortable temperatures, and related benefits. Thanks to the Metric Isolation power (below) even without further magic the conditions within a Brigadoon are unaffected by conditions in the greater universe. Integrated Utility Artifacts (2*): This second set is a set of complex control consoles which each provide their operators with +10 successes on a particular Thaumaturgic Art or Science – but are quite immobile, occasionally hit their user’s with energy feedback, and require considerable expertise to get the best results from – problems which, reduce them to one-dot artifacts. The standard selection includes Alchemy (synthesizer console), Detection (sensor console), Energetics (“weapons” console), Healing (medical bay), Illusion (display and environmental console), Technomancy (engineering room), Telekinesis (drive console), Telepathy (communication console), Travel (drive systems and teleporter), and Warding (shield console). Wyld Spaces (3*): Further incidences of Wyld Revocation can be purchased at half cost, rounded down. Geomantic Bounding (1*): A Brigadoon’s energies recirculate, making it independent of external geomancy beyond it’s own boundaries. Metric Isolation (1*): A Brigadoon’s zone of influence is warped into a private pocket realm, like a Freehold. As such, it tends to appear to outside observers as some acceptable sort of feature – a ship or planetoid or some such. Unlike a freehold, the area is only loosely anchored within space; and may be relatively easily moved around without respect for mass, gravitation, or inertia by any form of internal drive – including thaumaturgy. Spatial Scaling (1*): Thaumaturgy worked within the area uses space scales rather than measurements suitable for a planetary surface. Thus “drive” effects will allow a Brigadoon to far exceed the speed of light, short-range apportion will allow groups of people and stockpiles of supplies to be transported to and from any convenient planet, communications magic operates over many light seconds, and magical attacks can be launched at incredible range. Sadly, there’s a slight problem with this near Earth; while the rest of the cosmos was shaped out of a rather limited amount of space, the geometry near Earth is a lot more stable. There! Those should work perfectly for that they needed! Putting a few half-castes or even god-bloods on in shifts would let them navigate and keep an eye out for anything that might threaten their flying saucers… Heh! “I Canna gie it more power Jimmie boy! I be out of motes!”… no wonder Scotty’s time estimates were always in hours unless he pulled a stunt! He needed to respire more! After he had the design… it didn’t take long to make them! There were plenty of asteroids and such with enough mass and upgradable minor demesnes! Charles dropped by to see Ms Cress after leaving the reception again to tell her that he’d gotten her ships done! What, ALREADY? It couldn’t have been more than half a day, and the boy had spent a good chunk of that fooling around at a reception or poking around in Yu-Shan! He jumped them over to the right gate. He’d assigned five temporary crewmen to each one to pilot them until the Bronzers could get some of their own people aboard! The scale had been impressive enough – but it was… just a mask on top of a pocket dimension that was being generated by … a MANSE?!?! How in oblivion had the boy made THAT work? Ms Cress nodded sagely… Primordial Thaumaturgist-Architect. When what you had was Manses, no doubt every problem looked like a demesne. She should have expected it; Primordials were pretty much defined by their monomania! Charles happily showed her the basics of the place – the central control area, the defense mechanisms, the lovely classic village and gardens and a few other facilities, the supply systems, the little mossy groves, and so on… It wasn’t exactly what she was expecting in a spaceship! Ms Cress placed some near-frantic calls… The boy really DID seem to simply be… ridiculously over-helpful! What if he’d given this stuff to the Silver Faction first?… What had he ALREADY given out?!? !